Night at the Museum: Secret of the Tomb turned out to be the most diverse project yet, in terms of the animation that was done. There were all sorts of creatures to animate, and dozens of gags that needed to "land" as intended. We worked on the Fox Studios Lot in Century City for the postvis part of post-production, and it was inspiring to work in another Hollywood landmark. Postvis was an exciting new challenge for me to tackle, since it was my first time using Maya for extensive lighting and rendering, as well as After Effects and some Nuke for compositing and roto. The previs team was also complemented by skilled compositors who made our CG elements look great in the postvis shots. Like Furious 7, this was another film I worked on that was affected by the early death of one of its actors (Robin Williams), and although it was a troubling experience to go through, I feel that his character's story arc in the movie was a respectful sendoff to the legendary entertainer. 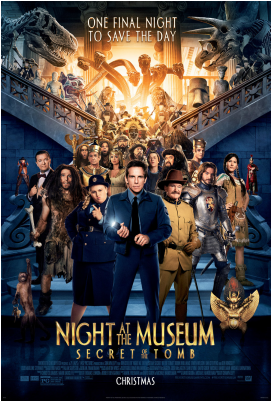 Night at the Museum: Secret of the Tomb was one of ten semi-finalists for an Academy Award nomination for "Best Visual Effects" in 2015.